Cedar Key, Florida is at the end of State Road 24 in North Central Florida on the Gulf of Mexico. 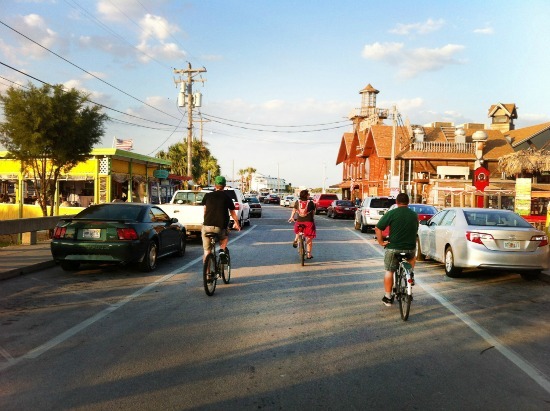 It is an Old Florida fishing village of about 700 people that has become a tourist attraction in this part of the state. This delightful destination is a straight shot from Gainesville and the University of Florida. 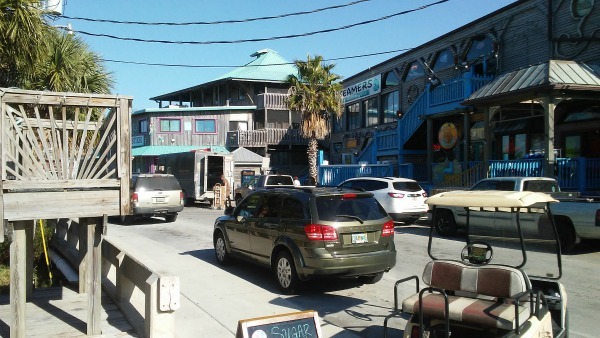 There are several very good seafood restaurants in Cedar Key, and numerous lodging facilities. Each year a couple of festivals are held here: The Annual Fine Arts Festival (last weekend of March) and the Cedar Key Seafood Festival (third weekend in October). The Dock is what locals call the old waterfront area with many shops and restaurants. 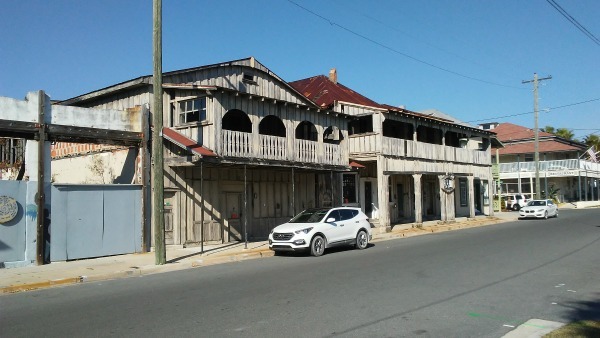 The rest of the town, including the old downtown section, is natural and weathered and somewhat run down, giving you a special feeling of being in Old Florida. Many of the homes are more than 100 years old and in all kinds of condition. Driving through the quiet streets you will see completely rehabilitated cottages next to weather beaten old houses that have never seen a paint brush. There are several newer low rise condominiums and motels near the downtown area that are typically designed to fit in with the Old Florida feel. 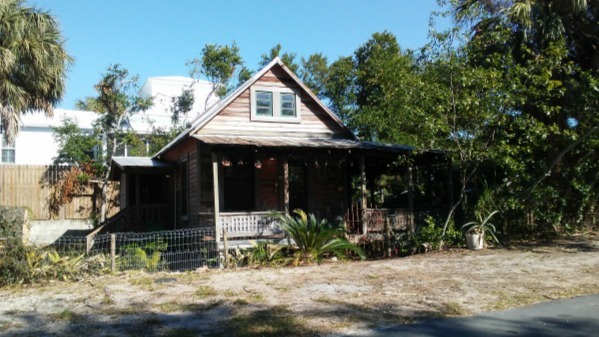 Newer homes are in the wooded areas that surround Cedar Key. The newer homes are usually built up on stilts or columns to give them protection from storm surges that often accompany hurricanes. 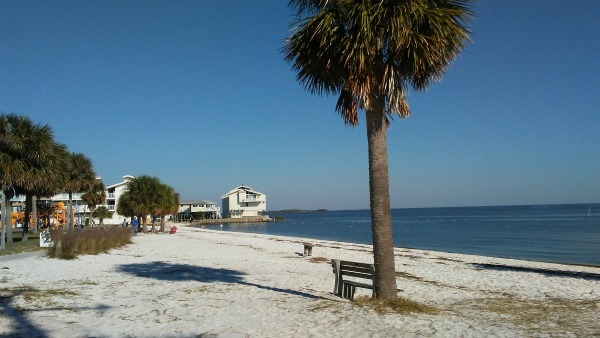 An unusual feature that makes Cedar Key different than most communities on this sparsely settled Gulf coast is the small beach in a downtown park near The Dock. For such a small town, it has a prominent place in Florida History. Arrowheads dating back 12,000 years have been found in the area, along with various shell mounds created by the ancient Indians. Modern settlement of Cedar Key began about 1839 when General Zachary Taylor built Fort No. 4 on Depot Key; it became Army headquarters during the early part of the Seminole Wars. 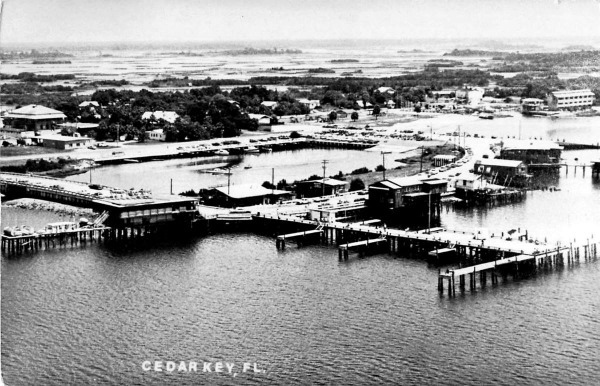 In the years before the Civil War, Cedar Key developed into a major Florida port. Lumber and naval stores from the mainland were shipped out of the small village to major cities around the world. By 1860, there were two saw mills producing cedar slats for shipment to pencil factories up north. 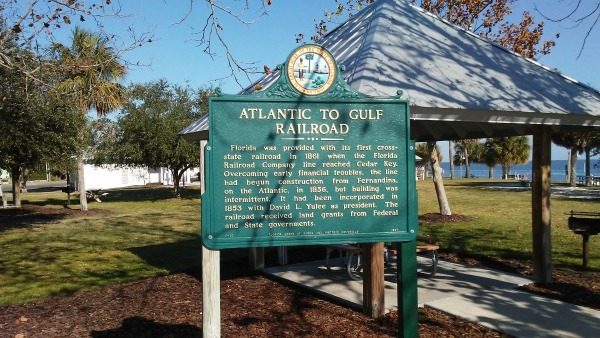 Also in 1860, David Levy Yulee completed his Florida railroad that crossed the state from Fernandina to Cedar Key. Yulee was a U.S. Senator and an interesting character in Florida history. Right about the time the railroad was completed, Parson and Hale's General Store was completed. Today it is known as the Island Hotel. During the Civil War, a lot of salt was produced around Cedar Key for use by the Confederate Army. Much cotton was also shipped out of Cedar Key. The Union army and navy destroyed a lot of Cedar Key during the war, and finally occupied the village until the end of the war. When Henry Plant's railroad reached Tampa in 1886, Cedar Key's importance as a port declined and it began to lose population and industry. About ten years later, a major hurricane hit Cedar Key, killing 100 people and wiping out the saw mills and most other buildings. A couple of months later, a fire just about finished the job of destruction. By the beginning of the 1900s, the major industries in Cedar Key had become sponging and oyster harvesting. Over harvesting exhausted these resources, and Cedar Key became a quiet place where people liked to spend weekends. The State of Florida helped local fishermen learn how to farm clams, so clam farming has become a major village industry. So also is tourism. 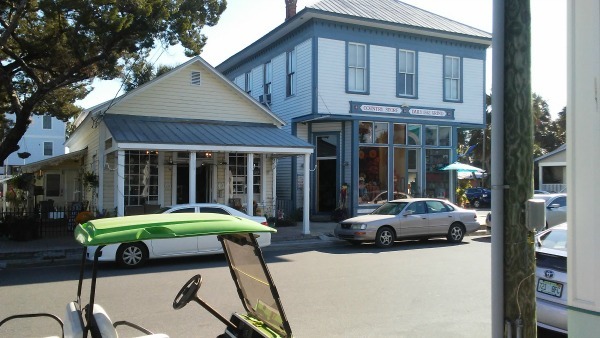 Cedar Key has a museum, and the entire village has national historic status through the Cedar Keys Historic and Archeological District and the U.S. National Register of Historic places. 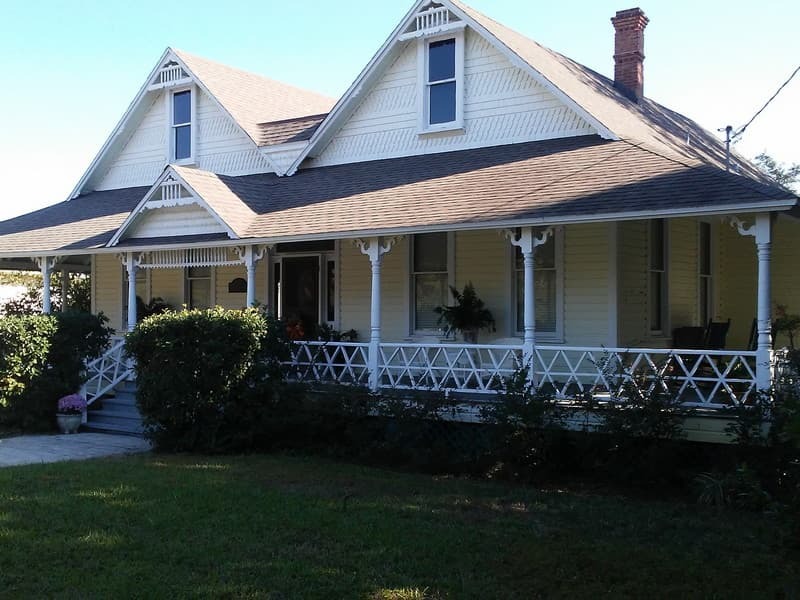 Cedar Key Bed & Breakfast, 810 3rd Street, Cedar Key FL 32625. 352-543-9000. Faraway Inn, 847 Third Street, Cedar Key, FL 32625. 888-543-5330. 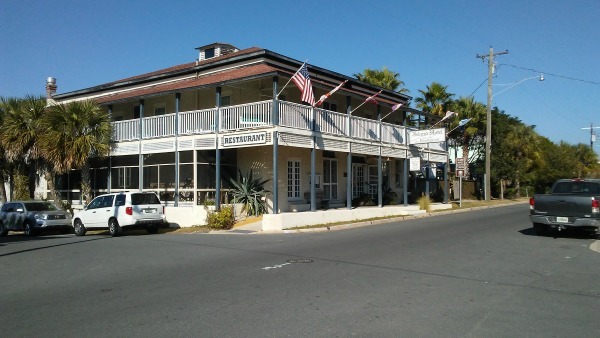 Island Hotel & Restaurant, 373 2nd Street, Cedar Key, FL 32625. On the National Register of Historic Places. 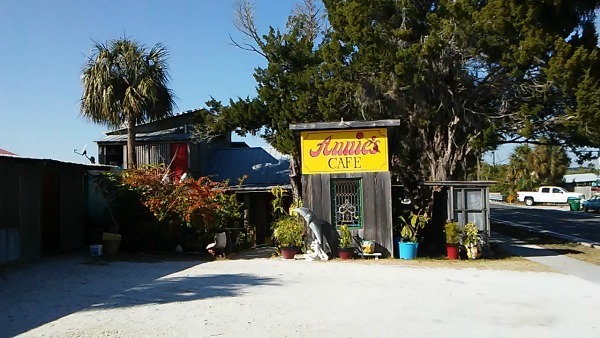 Annie's Cafe is in a nondescript weathered old building on your right as you first come into Cedar Key. It is several blocks away from the trendier and newer restaurants downtown at the waterfront dock area. When you enter the restaurant you walk through a tropical garden area that has some eye catching plant arrangements and makes you feel welcome. The interior is plain but clean and comfortable. The staff is very agreeable and service is prompt. Your first decision will be whether to dine inside or in the screened in dining room or the outside dining directly on the water. The weather conditions will no doubt drive your decision. Annie's specializes in good old fashioned cooking that takes you back to the simpler times in Old Florida. 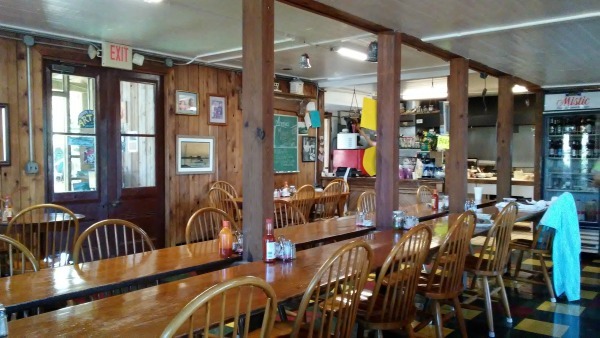 They have grits and greens, biscuits and gravy, and whatever the fresh fish of the day might be. It goes without saying that they have great hushpuppies. A favorite is their grouper sandwich, and they often have soft shell crab and if you're lucky, they are one of the few places around that still serves mullet when they are available. Annies is open for serve breakfast and lunch. If you are not into seafood, they also serve cheeseburgers. 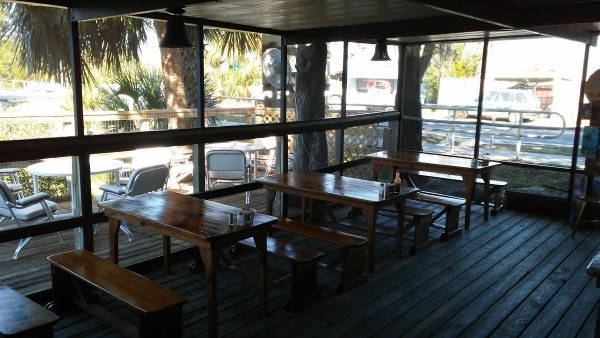 The owner/manager is Lisa, a member of an old Cedar Key family that goes back several generations. The restaurant building began it's life many years ago as a working fish house. Annie's is open Thursday through Tuesday from 6:30 am to 3:30 pm.